The New Covenant is not a continuation of the Old Covenant, and no part of the Old can be mixed in with the New. The New Covenant is something completely new and different - and better! The Old Covenant was based upon both man and God keeping their parts - but man failed miserably. So a New Covenant came about that was based solely upon God keeping His part, without man's involvement! It can now, therefore, never fail! Yeah, I totally get what you're saying, Randall. And I would add to all this, "But not just any man. :) Not just any man could've done this. Hebrews points out how Jesus is High Priest "according to the order of Melchizedek. Jesus "has come, not according to the law of a fleshly commandment, but according to the power of an endless life" (Heb 7:16). 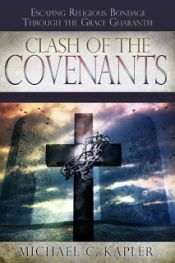 There's much more to be studied and understood about the order of Melchizedek, but indeed your point is taken that the covenant was dependent upon a man - a man who shed his blood and died, without which there would have been no new covenant. It is not our faithfulness to God but His faithfulness to us. So many people try and try to live up to perfection and not rely on Christ. We are solely dependent on him. Also it is crucial that people realize that just because it says "New testament." that does not mean that it was in existence. Jesus was still under the law, it was not until after he died and raised, that the new covenant became new.